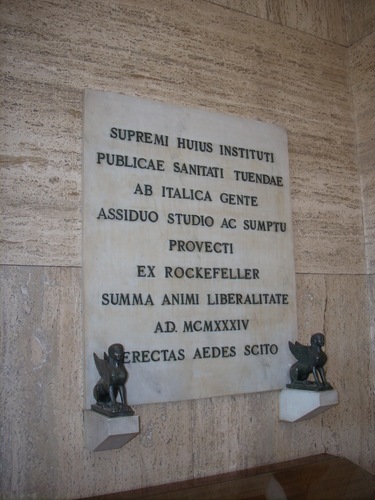 In a waiting-room of the Istituto Superiore di Sanità in Rome, just on the right of the entrance hall, there is a marble memorial tablet that remembers the crucial help given by The Rockefeller Foundation to the establishment of the Institute in 1934. The Latin inscription reads as follows: "SUPREMI HUIUS INSTITUTI / PUBLICAE SANITATI TUENDAE / AB ITALICA GENTE / ASSIDUO STUDIO AC SUMPTU / PROVECTI / EX ROCKFELLER / SUMMA ANIMI LIBERALITATE / A.D. MCMXXXIV / ERECTAS AEDES SCITO". Two little bronze sphinxes decorate the tablet.